How did ‘play’ shape the design and experience of creating Serendip-o-matic? Here are my notes from the Digital Humanities 2014 paper on ‘Play as Process and Product’ I did with Brian Croxall, Scott Kleinman and Amy Papaelias based on the work of the 2013 One Week One Tool team. 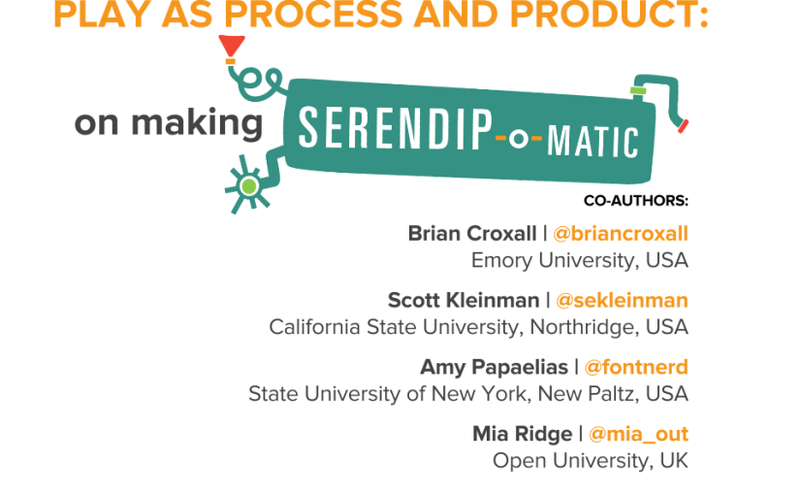 Scott has blogged his notes about the first part of our talk, Brian’s notes are posted as ‘“If hippos be the Dude of Love…”: Serendip-o-matic at Digital Humanities 2014‘ and you’ll see Amy’s work adding serendip-o-magic design to our slides throughout our three posts. I’m Mia, I was dev/design team lead on Serendipomatic, and I’ll be talking about how play shaped both what you see on the front end and the process of making it. How did play shape the process? The playful interface was a purposeful act of user advocacy – we pushed against the academic habit of telling, not showing, which you see in some form here. 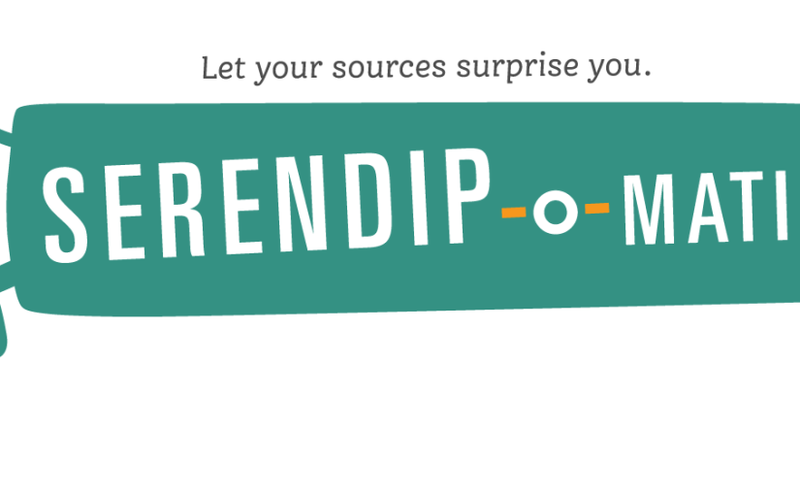 We wanted to entice people to try Serendipomatic as soon as they saw it, so the page text, graphic design, 1 – 2 – 3 step instructions you see at the top of the front page were all designed to illustrate the ethos of the product while showing you how to get started. How can a project based around boring things like APIs and panic be playful? Technical decision-making is usually a long, painful process in which we juggle many complex criteria. But here we had to practice ‘rapid trust’ in people, in languages/frameworks, in APIs, and this turned out to be a very freeing experience compared to everyday work. Just in case anyone here isn’t familiar with APIs, APIs are a set of computational functions that machines use to talk to each other. Like the bank in Monopoly, they usually have quite specific functions, like taking requests and giving out information (or taking or giving money) in response to those requests. We used APIs from major cultural heritage repositories – we gave them specific questions like ‘what objects do you have related to these keywords?’ and they gave us back lists of related objects. The term ‘UX‘ is another piece of jargon. It stands for ‘user experience design’, which is the combination of graphical, interface and interaction design aimed at making products both easy and enjoyable to use. Here you see the beginnings of the graphic design being applied (by team member Amy) to the underlying UX related to the 1-2-3 step explanation for Serendipomatic. The ‘feed’ part of Serendipomatic parsed text given in the front page form into simple text ‘tokens’ and looked for recognisable entities like people, places or dates. There’s nothing inherently playful in this except that we called the system that took in and transformed the text the ‘magic moustache box’, for reasons lost to time (and hysteria). These terms were then mixed into database-style queries that we sent to different APIs. We focused on primary sources from museums, libraries, archives available through big cultural aggregators. Europeana and the Digital Public Library of America have similar APIs so we could get a long way quite quickly. We added Flickr Commons into the list because it has high-quality, interesting images and brought in more international content. [It also turns out this made it more useful for my own favourite use for Serendipomatic, finding slide or blog post images.] The results are then whirled up so there’s a good mix of sources and types of results. This is the heart of the magic moustache. User-focused design was key to making something complicated feel playful. Amy’s designs and the Outreach team work was a huge part of it, but UX also encompasses micro-copy (all the tiny bits of text on the page), interactions (what happened when you did anything on the site), plus loading screens, error messages, user documentation. Without all this work on the graphic design – the look and feel that reflected the ethos of the product – the underlying playfulness would have been invisible. This user focus also meant removing internal references and in-jokes that could confuse people, so there are no references to the ‘magic moustache machine’. Instead, ‘Serendhippo’ emerged as a character who guided the user through the site. But how does a magic moustache make a process playful? The moustache was a visible signifier of play. It appeared in the first technical architecture diagram – a refusal to take our situation too seriously was embedded at the heart of the project. This sketch also shows the value of having a shared physical or visual reference – outlining the core technical structure gave people a shared sense of how different aspects of their work would contribute to the whole. After all, if there aren’t any structure or rules, it isn’t a game. This playfulness meant that writing code (in a new language, under pressure) could then be about making the machine more magic, not about ticking off functions on a specification document. The framing of the week as a challenge and as a learning experience allowed a lack of knowledge or the need to learn new skills to be a challenge, rather than a barrier. My role was to provide just enough structure to let the development team concentrate on the task at hand. In a way, I performed the role of old-fashioned games master, defining the technical constraints and boundaries much as someone would police the rules of a game. Previous experience with cultural heritage APIs meant I was able to make decisions quickly rather than letting indecision or doubt become a barrier to progress. Just as games often reduce complex situations to smaller, simpler versions, reducing the complexity of problems created a game-like environment. Ultimately, a focus on the end user experience drove all the decisions about the backend functionality, the graphic design and micro-copy and how the site responded to the user. It’s easy to forget that every pixel, line of code or text is there either through positive decisions or decisions not consciously taken. User experience design processes usually involve lots of conversation, questions, analysis, more questions, but at OWOT we didn’t have that time, so the trust we placed in each other to make good decisions and in the playful vision for Serendipomatic created space for us to focus on creating a good user experience. The whole team worked hard to make sure every aspect of the design helps people on the site understand our vision so they can get with exploring and enjoying Serendipomatic. Conversations trump specifications and showing trumps telling; use any means you can to make sure you’re all talking about the same thing. Find ways to create a shared vision for your project, whether on mood boards, technical diagrams, user stories, imaginary product boxes. Find ways to remind yourself of the real users your product will delight and let empathy for them guide your decisions. It doesn’t matter how much you love your content or project, you’re only doing right by it if other people encounter it in ways that make sense to them so they can love it too (there’s a lot of UXy work on ‘on-boarding’ out there to help with this). User-centred design means understanding where users are coming from, not designing based on popular opinion.you can use tools like customer journey maps to understand the whole cycle of people finding their way to and using your site (I guess I did this and various other UXy methods without articulating them at the time). Document decisions and take screenshots as you go so that you’ve got a history of your project – some of this can be done by archiving task lists and user stories. Having someone who really understands the types of audiences, tools and materials you’re working with helps – if you can’t get that on your team, find others to ask for feedback – they may be able to save you lots of time and pain. Design and UX resources really do make a difference, and it’s even better if those skills are available throughout the agile development process. Posted on 10th July 2014 4th February 2015 Categories Digital humanities, UncategorisedTags conference, digital humanities, geek joy, hackday, OneWeekOneTool, programming, project management, prototype, user experience, UX1 Comment on How did ‘play’ shape the design and experience of creating Serendip-o-matic? I’m sitting in a hotel next to the George Mason University’s Fairfax campus with a bunch of people I (mostly) met last night trying to work out what tool we’ll spend the rest of the week building. We’re all here for One Week, One Tool, a ‘digital humanities barn raising’ and our aim is to launch a tool for a community of scholarly users by Friday evening. The wider results should be some lessons about rapidly developing scholarly tools, particularly building audience-focused tools, and hopefully a bunch of new friendships and conversations, and in the future, a community of users and other developers who might contribute code. I’m particularly excited about trying to build a ‘minimum viable product‘ in a week, because it’s so unlike working in a museum. If we can keep the scope creep in check, we should be able to build for the most lightweight possible interaction that will let people use our tool while allowing room for the tool to grow according to uses. We met up last night for introductions and started talking about our week. I’m blogging now in part so that we can look back and remember what it was like before we got stuck into building something – if you don’t capture the moment, it’s hard to retrieve. The areas of uncertainty will reduce each day, and based on my experience at hack days and longer projects, it’s often hard to remember how uncertain things were at the start. Are key paradoxes of #owot a) how we find a common end user, b) a common need we can meet and c) a common code language/framework? Today we heard from CHNM team members Sharon Leon on project management, Sheila Brennan on project outreach and Patrick Murray-John on coding and then got stuck into the process of trying to figure out what on earth we’ll build this week. I don’t know how others felt but by lunchtime I felt super impatient to get started because it felt like our conversations about how to build the imaginary thing would be more fruitful when we had something concrete-ish to discuss. (I think I’m also used to hack days, which are actually usually weekends, where you’ve got much less time to try and build something.) We spent the afternoon discussing possible ideas, refining them, bouncing up and down between detail, finding our way through different types of jargon, swapping between problem spaces and generally finding our way through the thicket of possibilities to some things we would realistically want to make in the time. We went from a splodge of ideas on a whiteboard to more structured ‘tool, audience, need’ lines based on agile user stories, then went over them again to summarise them so they’d make sense to people viewing them on ideascale. How would a suggested tool change your work? Do you know of similar tools (we don’t want to replicate existing work)? Update Tuesday morning: two other participants have written posts, so go check them out! 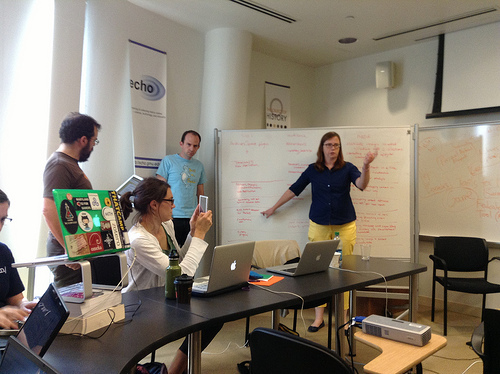 Amanda Visconti’s Digital Projects from Start to Finish: DH Mentorship from One Week One Tool (OWOT), Brian Croxall’s Day 1 of OWOT: Check Your Ego at the Door and Jack Dougherty’s Learning Moments at One Week One Tool 2013, Day 1. I’ve got a whole week and a bit off uni (though of course I still have my day job) and I got a bit over-excited and booked two geek talks (and two theatre shows). This post is summarising a talk on Top ten secret weapons for performance testing in an agile environment, organised by the BCS’s SPA (software practice advancement) group with Patrick Kua from ThoughtWorks. His slides from an earlier presentation are online so you may prefer just to head over and read them. [My perspective: I’ve been thinking about using Agile methodologies for two related projects at work, but I’m aware of the criticisms from a requirements engineering perspective that doesn’t deal with non-functional requirements (i.e. not requirements about what a system does, but how it does it and the qualities it has – usability, security, performance, etc) and of the problems integrating graphic and user experience design into agile processes (thanks in part to an excellent talk @johannakoll gave at uni last term. Even if we do the graphic and user experience design a cycle or two ahead, I’m also not sure how it would work across production teams that span different departments – much to think about. Make it an explicit requirement upfront and throughout the process (as with all non-functional requirements in agile). Agile should bring the painful things forward in the process. Two ways: non-functional requirements can be dotted onto the corner of the story card for a functional requirement, or give them a story card to themselves, and manage them alongside the stories for the functional requirements. He pointed out that non-functional requirements have a big effect on architecture, so it’s important to test assumptions early. Team dynamics are important – performance testers should be part of the main team. Products shouldn’t just be ‘thrown over the wall’. Insights from each side help the other. 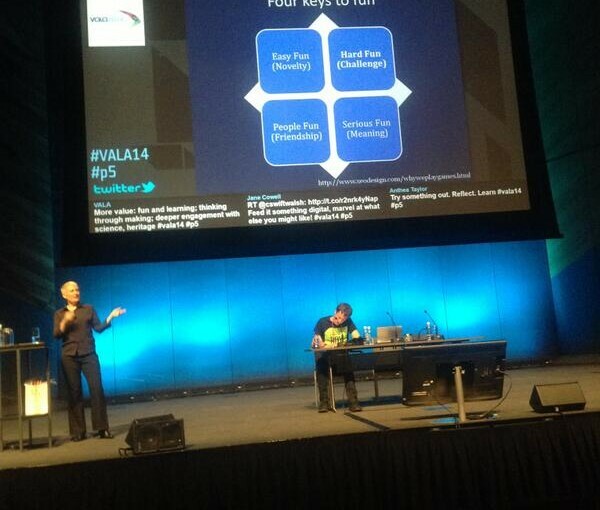 Someone from the audience made a comment about ‘designing for testability’ – working together makes this possible. Bring feedback cycles closer together. Often developers have an insight into performance issues from their own experience – testers and developers can work together to triangulate and find performance bottlenecks. Pair on performance test stories – pair a performance tester and developer (as in pair programming) for faster feedback. Developers will gain testing expertise, so rotate pairs as people’s skills develop. E.g. in a team of 12 with 1 tester, rotate once a week or fortnight. This also helps bring performance into focus through the process. Customer as in end user, not necessarily the business stakeholder. Existing users are a great source of requirements from the customers’ point of view – identify their existing pain points. Also talk to marketing people and look at usage forecasts. Use personas to represent different customers or stakeholders. It’s also good to create a persona for someone who wants to bring the site down – try the evil hat. You need to be as disciplined and rigorous as possible in agile. Good performance testing needs rigour. Observe test results – what do you see? Be data driven. Formulate hypothesis – why is it doing that? Design an experiment – how can I prove that’s what’s happening? Lightweight, should be able to run several a day. Like all good experiments, you should change only one thing at a time. Scheduling around iterative builds makes it more possible. A few tests during build is better than a block at the end. Automate early. Fishbone structure – iterate and enhance tests as well as development. Sashimi slicing is another technique. Test once you have an end-to-end slice. Slice by presentation or slice by scenario. Use visualisations to help digest and communicate test results. Build them in iterations too. e.g. colour to show number of http requests before get error codes. If slicing by scenario, test by going through a whole scenario for one persona. It’s an investment for the future, so the amount of automation depends on the lifetime of the project and its strategic importance. This level of discipline means you don’t waste time later. Automated compilation – continuous integration good. Automated test orchestration – playing with scenarios, put load generators through profiles. Automated scheduling – part of pipeline. Overnight runs. Why automate? Reproducible and constant; faster feedback; higher productivity. Can add automated load generation e.g. JMeter, which can also run in distributed agent mode. Ideally run sanity performance tests for show stoppers at the end of functional tests, then a full overnight test. Application level – compilation and test units; functional test; build RPM (or whatever distribution thingy). Into performance level – 5 minute sanity test; typical day test. Spot incremental performance degradation – set tests to fail if the percentage increase is too high. Hold it to the same level of quality as production code. TDD useful. Unit test performance code to fail faster. Classic performance areas to unit test: analysis, presentation, visualisation, information collecting, publishing. V model of testing – performance testing at top righthand edge of the V.
Visualisations help communicate with stakeholders. Weekly showcase – here’s what we learned and what we changed as a result – show the benefits of on-going performance testing. General comments from Q&A: can do load generation and analyse session logs of user journeys. Testing is risk migitation – can’t test everything. Pairing with clients is good. In other news, I’m really shallow because I cheered on the inside when he said ‘dahta’ instead of ‘dayta’. Accents FTW! And the people at the event seemed nice – I’d definitely go to another SPA event. …you could go and read some of the blogs listed in the ComputerWeekly.com IT Blog Awards 08. If you like this blog, you could vote for it in the Programming and technical blogs category, but given how good some of the other blogs are, I certainly don’t expect you to! On the other hand, if you’ve really got time to be bored, maybe you could figure out the best way for a one-programmer (i.e. me*) project to store and publish layers of user-generated content on top of data drawn from APIs. KTHXBAI! * More about that project soon when I report on the mashed museum day – I’d love other programmers to join me.